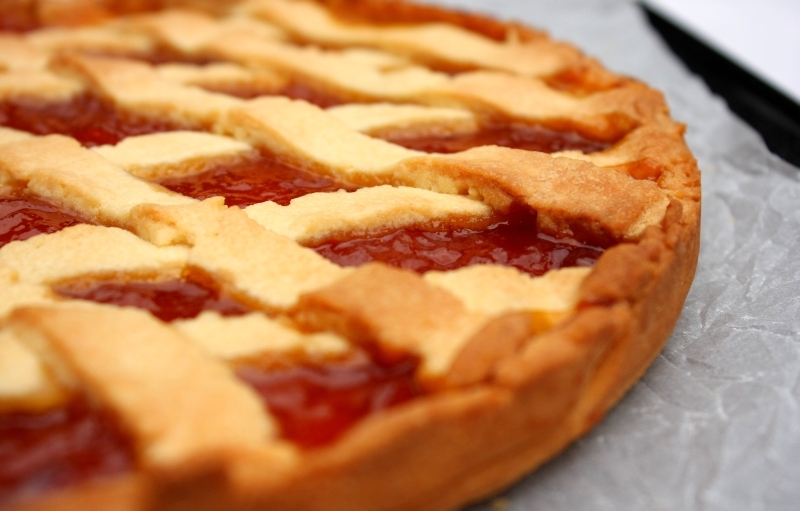 Crostata is a traditional Italian tart, usually filled with jam, but sometimes with ricotta cheese, nuts and poached fruit. The pastry is silky smooth, and the jam filling sweet and fruity. We make dried apricot conserve at our place as the filling, but you can use any not-too-sweet, good quality jam. Don’t be put off by the idea of making your own apricot jam for this tart as it is simplicity itself. I’ve included the recipe below, if you want to do that, and have the time. With several days holiday for Easter, it was a perfect occasion for us to make it. 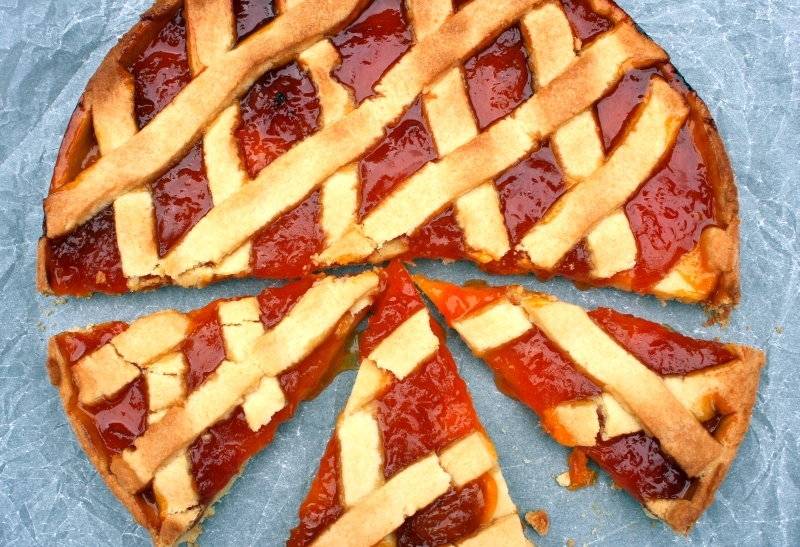 Crostata works beautifully as a dessert with cream or ice cream; or for morning or afternoon tea. Firstly, make the pastry. Place the flour, icing sugar and butter in a food processor and whizz it up until the mixture looks like fine breadcrumbs. Add the egg yolks and 1/4 cup icy cold water and process until the mixture forms a smooth dough. Scoop out of the bowl, wrap in cling wrap and let it sit for about 20 minutes. If is is a really warm day, put it in the fridge. Preheat the oven to 180 C and grease a 23 cm spring form tin, or fluted flan tin with a removable base. Form 1/2 the pastry into a ball and place between 2 sheets of silicon paper. Roll out until it is about 5 mm thick and then line the base and sides with the pastry. If you are using a spring form tin, the pastry should come about 2 cm up the side of the tin. This pastry is quite easy to work with, so if your usual experience of this task involves collapsing pastry and tears, take heart and forge ahead. 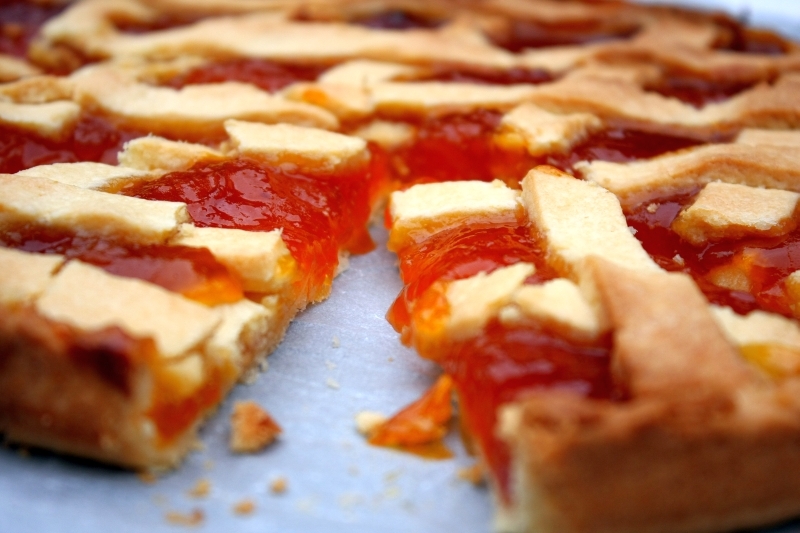 Spread the jam evenly across the base of the tart. Now roll out the remaining pastry and cut it into strips. Carefully drape the pastry strips over the pastry in a lattice pattern, leaving a nice gap between the strips so that the jam can be seen, glistening and jewel like. It’s not meant to be fancy, so don’t worry too much if the strips aren’t perfectly even. Trim any extra bits of pastry from the edges and bake in the oven for 35 – 40 minutes until the pastry is lightly golden. Serve warm or cool, on its own, or with vanilla ice cream or cream. This was the first jam I ever made and it is so easy and delicious. It never fails and will give you just the right amount of sweetness for this tart. It will make 4 cups, or 2 medium jars of jam, one for the crostata, and one for your breakfast toast. Put the apricots in a medium sized glass bowl and pour over 250 ml of boiling water. Leave to soak for several hours or overnight. The apricots will become very plump and absorb almost all the water. Place the apricot mixture in a large saucepan and add another 250 ml of water. Bring to the boil and simmer very gently, covered, until the apricots are very soft and squishy. Now add the juice of the lemon and the sugar. Mix together well and then turn the heat up. Boil rapidly for about 10 minutes. If you have a sugar thermometer, it will most likely have a mark for when jam has reached setting temperature. Otherwise after 10 minutes, take a teaspoon of the jam, put it on a saucer and put it in the freezer for a couple of minutes. If it has begun to set, the jam is ready. If not, boil for a few minutes more and try again. Take off the heat when the jam is ready and pour into glass jars which have been warmed in the oven at 100 C to sterilise them. While I was recipe-testing for my crostata post, I used plum jam and strawberry jam (store-bought as it’s not the height of summer fruit season here in Turin yet!) I’m keen to make my own jam this summer and would love to make an apricot jam. A lot of locals (hubby included!) here seem to like crostate best with apricot. Have bookmarked this recipe for the summer. Hi Margaret – I’ve been meaning to let you know, I tried this and it was just terrific. I roasted the apricots with a bit of vanilla bean paste, just to see – neither here nor there on that, but roasted apricots are special! Your crostata pastry dough was lovely, though I used only half the sugar amount (I’m pretty sure I used the right type of sugar, what we call powdered here? I should have checked in with you but was last minute.) Anyway, this was just a gorgeous recipe, and I can’t wait until apricots are back and I get to try it again. Also, I served it with dollops of sour cream. We had no leftovers, but I imagine a cold slice would have made a fine breakfast … can’t wait to try it again and see! Hi Margaret – I have apricots here now in California (fresh) and thought of this recipe, which I loved when you posted it. But I’m wondering if you think I could work directly with fresh fruit somehow, or if I should make it into jam first? I have my favorite apricots – Blenheims – and this tart should be more than worthy either way … I can’t wait! Oh my goodness this is such a good idea. I can’t wait to try it! Thanks Margaret! it looks very crusty and chunchy….